the powder form as there are many adulteration done to the commercial powder form of asafoetida to keep it non sticky and powdery for long time. Hence, I feel that such powdered asafoetida is not as flavourful as the compound asafoetida - the single piece or block of solid asafoetida. I prefer the compound asafoetida. 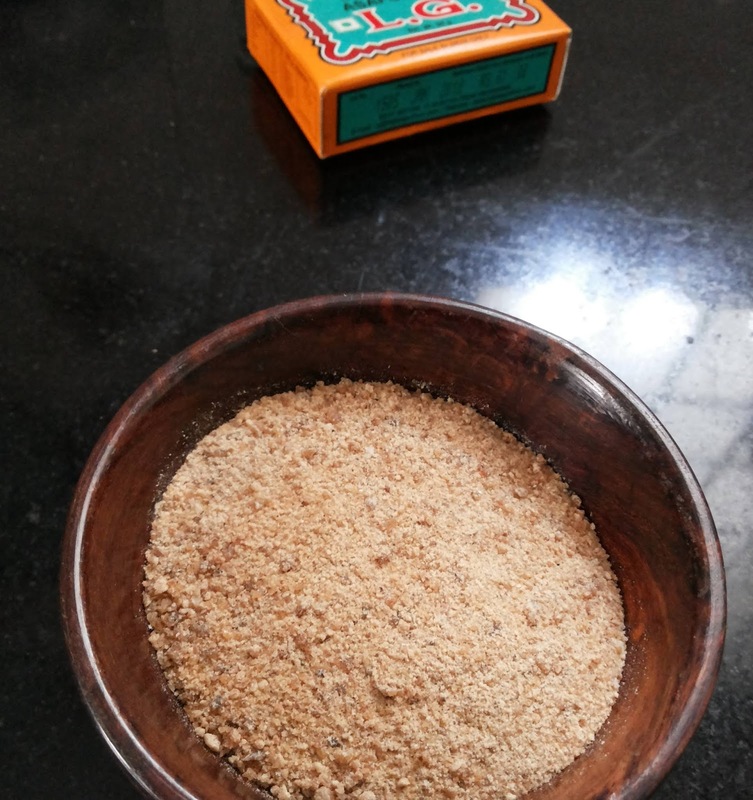 I buy this compound asafoetida and powder at home and store it. When I was a kid, my mother used to buy this compound asafoetida. It used to be in 50gms and 100gms pack. They will be wrapped in this dry green leaf (guess it is mandhaarai ilai) and that in turn will be packed in a cardboard box. Those days, asafoetida was not hard as today's. It used to be little soft and somewhat sort of tight gel. Both the compound asafoetida and the powdered form is available in market these days. I am sure that the powdered form has some adulteration in it. And the compound form - don't know how genuine and pure it is or which brand is good. Still.. I buy the compound form, hoping they are better than the powdered forms. And also personally.. I feel the compound form has more flavour than the powdered ones. And I am happy to buy them, powder and store them at home. There are three methods to get this compound asafoetida ready to use and store at home. They are more like simple kitchen tips rather than a procedure. Just do some home work and make sure you buy a good compound asafoetida in your locality. 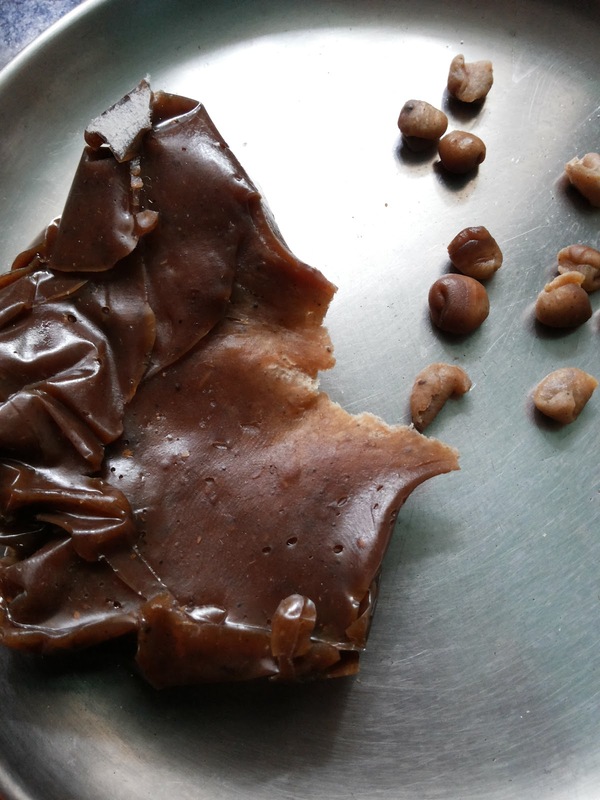 Sometimes the asafoetida will be very hard as rock and sometimes little soft as a tight jell (like amber). If it is hard, take care to unpack it and remove the plastic polythene wrap around it so that no tiny bit of the plastic wrap is stuck with it. Place the asafoetida in a old and clean news paper and partially cover it. 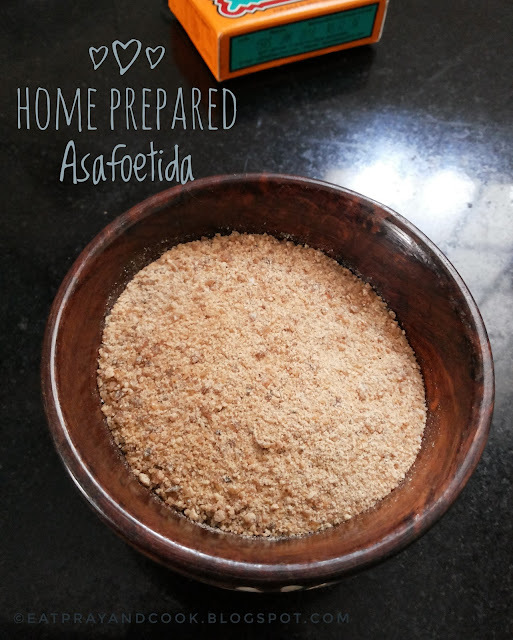 Take this asafoetida to a hard and safe surface and break it into pieces with a hammer. See to that the pieces of asafoetida doesn't jump out or scatter away. Now take these pieces in a mixer jar and powder it. Store this powder in an air tight container. 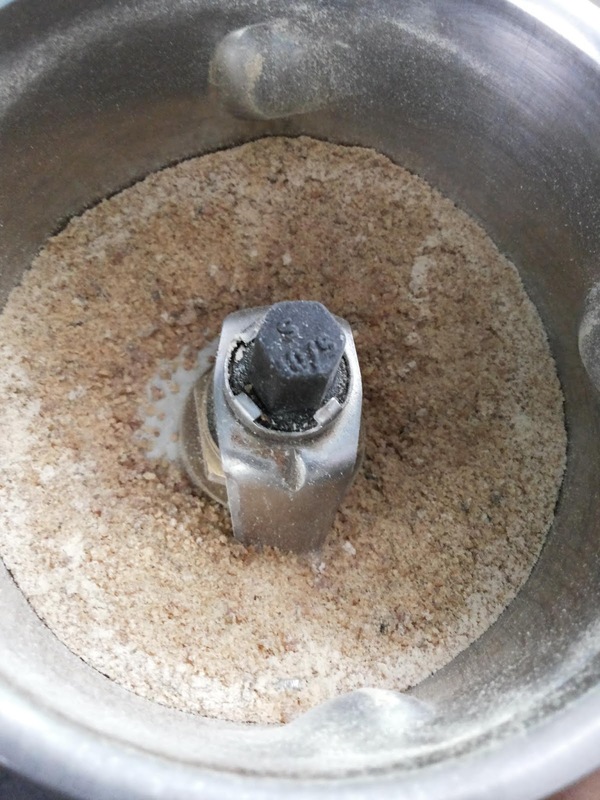 If the asafoetida you bought is a very hard one and you are finding difficult to break it with a hammer, then follow this method. Keep a kadai or a pan in stove. Place this asafoetida in the pan in low heat. As the heat penetrates the asafoetida, it will start to loosen a little bit and become soft. Now when you can bear the heat, take the compound asafoetida, pull out tiny bits, in a size of a green pea, make small balls. Let it cool down and store it in a container. It should be hard back again when it cools. If you still think it will stick with each other, then add 1/4 teaspoon or less of rice flour and shake it with the asafoetida balls. This will coat the tiny balls of asafoetida and prevent them from sticking with each other. These smalls bits of asafoetida you can add it when you boil dhal for sambar or while making rasam. Since this is not powder and is in bits, you can use it especially for recipes like sambar or rasam and the bits will dissolve in the water while boiling. But you cannot use this for making poriyal/stirfries or any dish where you just need powder to be used. In that case, you have to follow the next method. 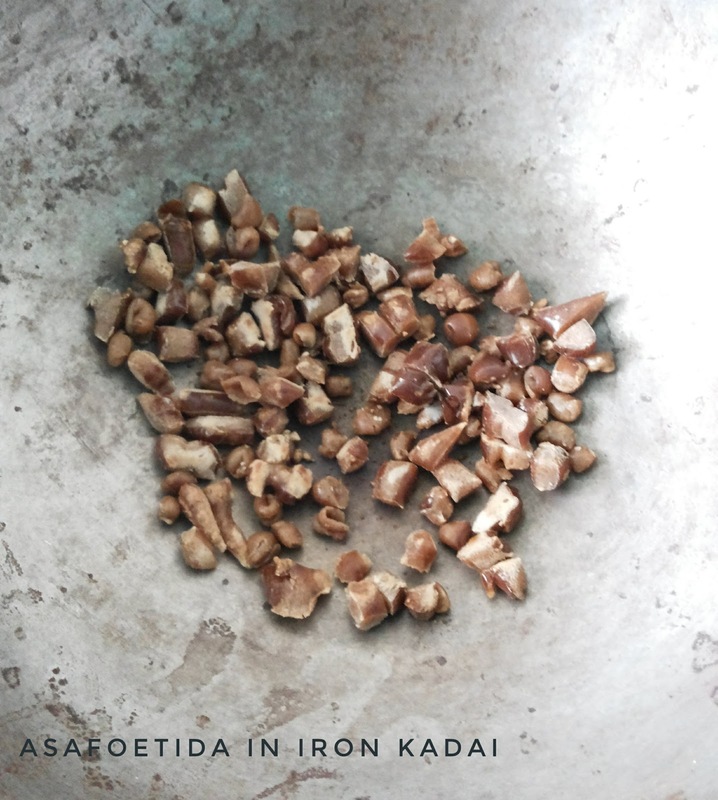 Buy the compound asafoetida try to break it into pieces with a hammer or if it is soft, then pull out big bits of it and dry roast them in low or medium heat. after few minutes, the asafoetida will soften and also will slightly puff up. Let it puff up well. This takes 5 to 10 minutes. Now turn off the heat and transfer this to a plate and let this cool down. Once it has reached the room temperature, powder them in a mixer. If you still find some bits soft and not getting powdered, then roast those soft bits alone again in a dry pan, let it puff out little, then cool and powder them again. Now store this powder in an air tight container. Roasted (the small bits) asafoetida is easier to powder than the raw one. 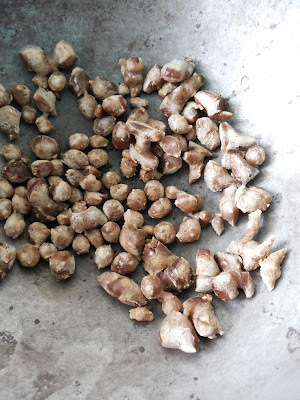 I generally store this compound asafoetida in both ways - small pea-size pieces and powder. i use the bits while making sambar, rasam, rasam-powder or moru. I use powder for other dishes like poriyal / stirfries. I always have this immense satisfaction when I use this home prepared asafoetida powder for cooking. 😇.